Steps to delete a team must be followed exactly. It's critical that if a team has been synced to TouchPad, you delete a team doing the following steps. This will also ENSURE that when you sync, even if they make updates on their SwimOffice site, that none of their updates will be pushed to TouchPad. TouchPad will ignore them. In the main menu, click Athlete Entries. Click Enter/Edit Team Data on the right. Select a team and click Delete Team. TouchPad will give you a warning that you are about to delete a team, x number of athletes and x number of entries. 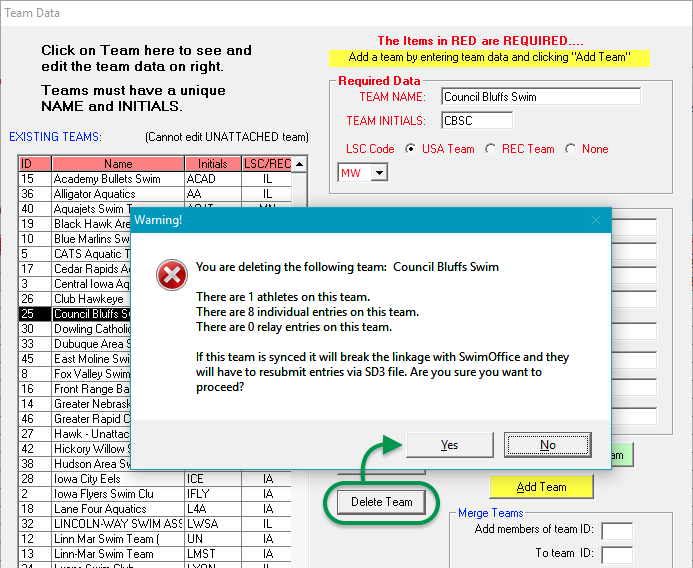 IMPORTANT: This PERMANENTLY deletes the team from this meet once you sync and breaks the connection with SwimOffice so that syncing is no longer possible for the deleted team. This is to prevent syncing problems. Click Yes and Yes again to confirm. A message will confirm what you deleted. Click OK. If you have done the above and the deleted team decides to re-enter the meet, then as the dialog warned, the only way they can do so is to export entries from SwimOffice in an SD3 file, then have you import them into TouchPad via the Entry Manager. You will also need to export results and have them manually import into SwimOffice.